Building eValuate can help you reap the rewards of an energy efficient home. We are ABSA accredited energy assessors and can assess and certify your building plans for BCA energy efficiency compliance. As of May 1st 2013, Tasmania has moved from a minimum 5-Star energy efficiency rating to a minimum 6-Star rating for residential buildings. New buildings will be subject to more stringent design standards and those which fail to comply under the BCA provisions may have to undergo an assessment using specialised computer simulation software. A house energy rating (building thermal assessment) will highlight areas of inefficiency in your home. We can then recommend changes in design to comply with the new 6-Star National House Energy Rating Scheme. Building eValuate are ABSA accredited energy assessors. 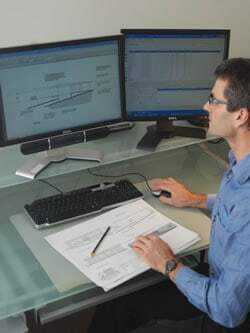 We use the AccuRate sustainability software, developed by the CSIRO, to assess multiple factors which affect the thermal performance of a building. These factors could include: climate and wind; location; orientation, form and design; building fabric; and occupant behaviour. What are the benefits of an energy efficient home? Reduce your energy and water costs. Governments across Australia have recognised these benefits and introduced energy efficiency requirements that anyone building a new home in Tasmania needs to meet. Building eValuate can manage all aspects of assessing and documenting your home design in order to meet the requirements of council planning and environmental regulations. This advice could save you time and money by eliminating any costly changes or delays caused by non-compliant plans. Does an energy efficient home cost more to build? Smart design and choosing the right building materials and appliances are the key to delivering maximum efficiency benefits for the least cost. An energy efficient home need not cost more to build – it’s about designing your home to make the best use of space and to take advantage of natural elements like sunshine and rainfall. Professional advice from Building eValuate can help to ensure that you meet environmental regulations with cost-effective solutions. If you invest in better design and construction of your home, your investment can generally be recouped via lower energy costs and water bills and higher resale value. What do we require for the assessment? A site plan indicating the orientation of the buildings and any overshadowing structures. Plans, elevations and sections showing window sizes, eaves widths and building fabric details. Details on wall, floor and ceiling insulation. Details on windows and glazing (including the manufacturer and window type if available). How are house energy ratings reported? A form 55 (as required by the building surveyor). Certified drawings with relevant ABSA stamp and thermal specification block. Submission of certified drawings and documentation via email/hard copy. How much will it cost to have my property assessed? Assessment and documentation costs are quoted on an individual basis depending on the size, style and complexity of the project. We can quote you a price over the phone or fill out our contact form with the relevant details and we will promptly provide a quote.